The Galaxy S5 LTE-A – or Galaxy S5 Prime – may only be a South Korea affair, but Samsung is also working on another new flagship Android smartphone with monster specs that the whole world will be able to enjoy. The Galaxy Note 4, expected to be unveiled at IFA 2014 later this year, has apparently been spotted online in benchmark test results, which reveal many details about its hardware. 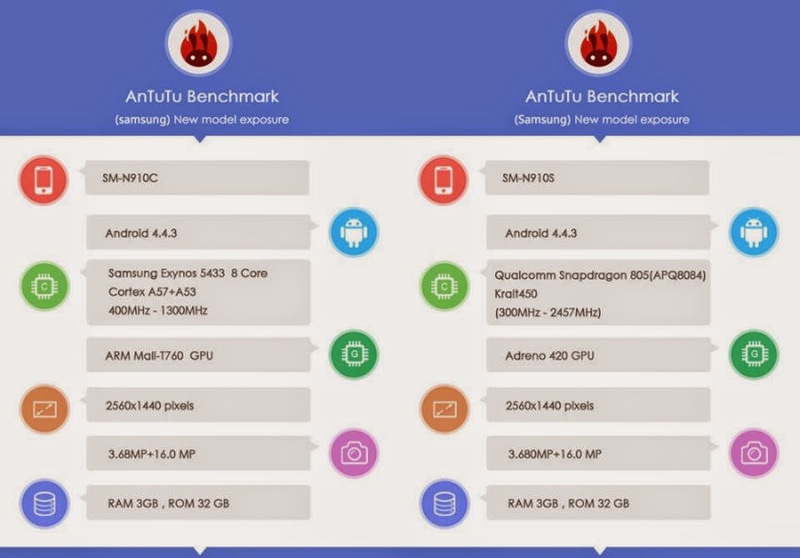 Two versions of the Galaxy Note 4 have been found in the AnTuTu benchmark database, including SM-N910C and SM-N910S, or Exynos and Qualcomm versions of the upcoming handset. Just like previous generations, the new Galaxy Note models will come with different system-on-chips (SoC) depending on the regions they’re sold in, including a 1.3GHz eight-core Samsung Exynos 5433 processor (four Cortex A57 and four Cortex-A53 cores) with ARM Mali-T760 GPU SoC, and a 2.5GHz quad-core Qualcomm Snapdragon 805 processor with Adreno 420GPU SoC. Both Galaxy Note 4 versions will pack the same high-resolution 2K display (2560 x 1440 resolution), 3GB of RAM, 32GB of storage, 16-megapixel camera and 3.68-megapixel front-facing camera. Recent reports have revealed the Galaxy Note 4 will come in two versions when it comes to design, including a model with a flexible screen and a regular version.